I love folk tales and fantasy in Indian cinema, and when they are combined with a theme involving eyes and blindness then that’s a combination guaranteed to make me watch. 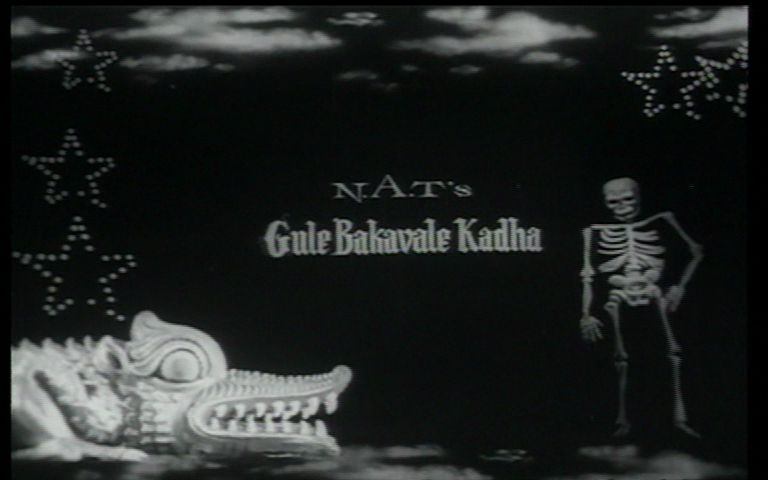 And Gulebakavali Katha doesn’t disappoint with plenty of eye references and fantastical scenes throughout. The story is reputably based on Madhira Subbanna Deekshitulu’s Kasimajili Kathalu which also provided the story line for Patala Bhairavi, although from time to time the story here reminded me of Jason’s quest in the Greek classics. It’s a fun film with the emphasis on the fantasy and NTR’s hero is dashing, suitably brave and self-sacrificing. The music is lovely and plentiful, and the sets and costumes are absolutely fabulous. 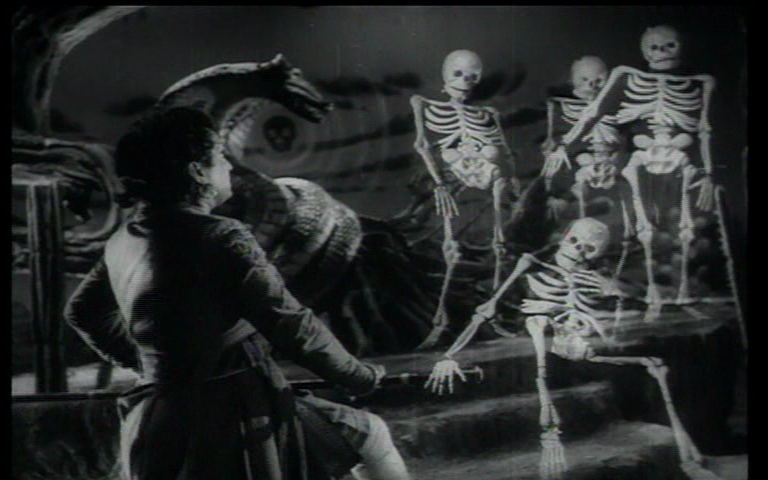 There are excellent opening titles featuring an animated skeleton, and the story opens in the best possible way with a song featuring Geetanjali and Jyothy as dancers. The storyteller introduces the tale of King Chandrasena (Mukkamala Krishnamurthy), his two wives and his wicked brother-in-law who is conspiring to take the throne. King Chandrasen’s first wife Gunavathi (Rushyendramani) falls pregnant after she is blessed by the goddess Parvathi. 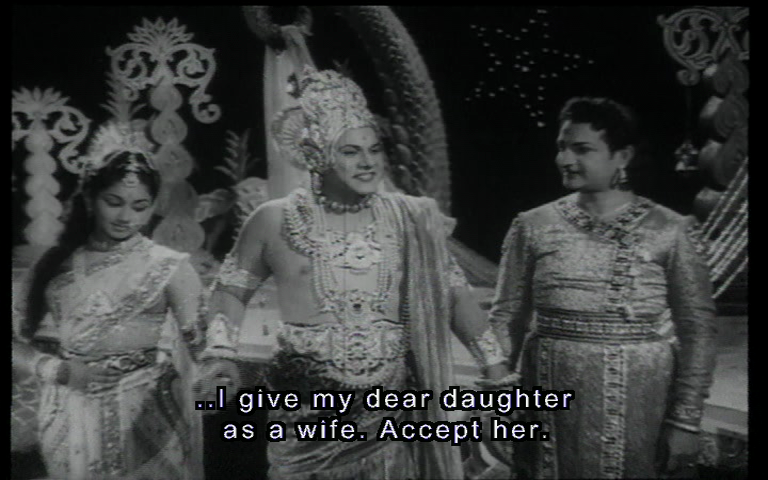 This makes his younger, second wife Rupavathi (Chayadevi) jealous even though Rupavathi already has 3 sons of her own. To make sure that her children will inherit the throne, Rupavathi plots with her brother Vakraketu (Rajanala Kaleswara Rao) to get rid of the baby and discredit her rival. With the help of the Royal astrologers, Vakraketu concocts a tale that the King will go blind if he sees his son. Not content with this form of banishment, Vakraketu then orders his soldiers to take the baby into the woods, kill him and bring back his eyes as proof of the deed. Of course it doesn’t go to plan and the baby ends up being rescued and brought up by a shepherd couple in the forest. 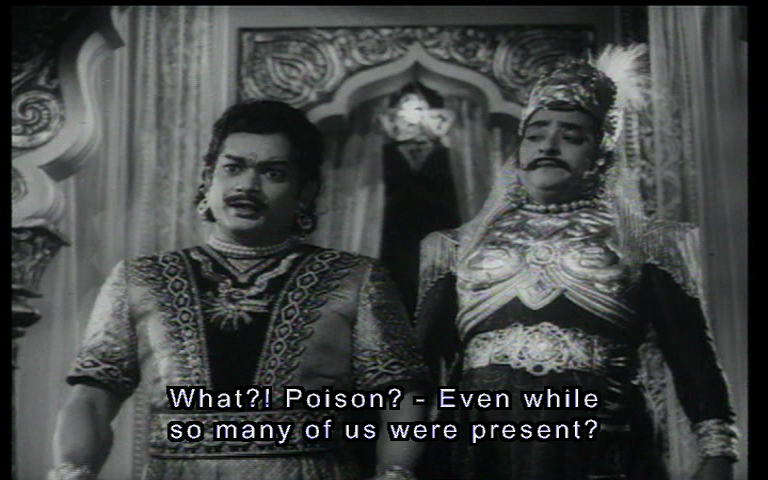 Rajanala makes an excellent villain here with his amazingly expressive eyes and appropriately evil laugh. His performance also provides a strong foundation for the story as he schemes his way towards the throne with the help of the treacherous army chief Dushtabuddi. He also has excellent moustache twirling skills! Meanwhile, as may be expected from someone who grows up as a goat-herder in the woods, Vijay (NTR) grows up to be a handsome well-spoken young man who has an amazing ability with a sword but no idea about his real parents. Despite his lowly start in life, Vijay is a man of principles and NTR gives him plenty of charm and humour to go with his bravery and spear throwing. He does look the part of the perfect fantasy prince and can look determined, puzzled, worried or intrigued as required. Now that Vijay is grown up and capable of thwarting his plans, Vakraketu finally decides to make his move on the throne by poisoning the King’s wine to destroy his sight. This happens to coincide with a hunting trip into the woods enabling Vijay to turn up just in time to be the last person the King sees before the poison takes effect, thus fulfilling the totally fabricated prophesy. While Vijay easily evades the soldiers sent to capture him he’s intrigued enough to climb up to the King’s lodge and discovers his heritage. After meeting his real mother, he sets out to discover the fabled Gulebakavali flower which will cure his father’s blindness. Vijay’s three elder brothers have grown up to be complete fools under the influence of their uncle, but they also decide to search out the fabled flower and they provide much of the comedy throughout the film. Although they’re not particularly funny they aren’t too irritating despite the youngest brother’s incredibly squeaky voice, and they do have an important role to play as they cheat their younger brother later on in the film. The rest of the comedy is provided by Atitelivi (Balakrishna) who befriends Vijay and helps confound and defeat Vijay’s three brothers and by Vijay himself as he proves he has plenty of brains to go with his bravery. On his quest for the gulebakavali flower Vijay has to overcome many challenges, and the first of these is in the form of a beautiful woman who has declared that she will marry the man who can beat her at dice. Yuktimati (Jamuna) provides plenty of glamour and looks stunning as she scams various rich men out of their wealth and takes them prisoner, although unlike Circe she doesn’t go as far as turning them into pigs. After his brothers succumb and are taken prisoner Vijay disguises himself as an old man and beats Yuktimati when he discovers her trick of using a mouse to distract her cat which serves as her lamp.It’s all rather silly and the cat and mouse are both obviously stuffed, but it’s a nice fairy-tale like idea and the song with NTR in disguise is excellent. Despite beautiful women throwing themself at him, the search for the gulebakavali flower must go on and Vijay leaves his new wife to continue looking for the cure for his father’s blindness. He picks the scariest looking spot in the entire forest to go to sleep, so it’s not surprising that he is awakened by a skeleton that attacks him as the statue starts to breathe smoke, the moon sports a skull and there are bats and snakes in abundance. However it was all just a test and after proving his bravery, Shiva gives Vijay an enchanted jewel which will enable him to become invisible and reach the yakshaloka. Once there he discovers the beautiful princess Bakavali and her entourage who guard the golden flower. The sets here are beautiful and as well as singing and dancing there is also synchronised swimming to enjoy. Peacock beds are obviously de rigueur for fantasy princesses and Bakavali has a rather nice example here. Back on Earth with the flower Vijay meets treachery and betrayal and becomes progressively more unshaven and tattered which makes the resemblance between him and his grandson Tarak very obvious. There are more damsels in distress to rescue and more fantastically gory eye scenes before Vijay adds a second wife to his collection by marrying Bakavali as well before heading home to save the day. Here are some more pretty pictures of the various beautiful women who all are happy to see Vijay, plus the elusive gulebakavali flower. While Gulebakavali Katha follows a fairly standard fantasy theme with a heroic prince overcoming various challenges it’s all done beautifully with stunning sets and some very sparkly jewelry. There is enough humour in Vijay’s character that he doesn’t become too sanctimonious despite all his self-sacrifice, and he seems quite delighted at the various women who throw themselves at him. Jamuna has the best described role among the women as Yuktimati along with her chief handmaiden Asha and it’s a shame that they disappear from the story so quickly. The effects are really quite innovative for the time and feature transformations, fighting skeletons and plenty of quite realistic eyes being thrown around. There is even a flying dragon as transportation although rather oddly it makes the same noise as is generally used for UFO’s. On reflection though, that perhaps does make sense! There are plenty of songs and some very beautiful duets although the mix of traditional songs and fifties ‘big band’ sound is occasionally a little strange. I really couldn’t decide which of these was my favourite, so here is a link to Nannu Dochokundavate with Vijay and Yuktimati, and below is Kalala Alalapai where Bakavali is dreaming of Vijay. I really enjoyed this film as the simple story unfolds so smoothly and the whole film looks absolutely stunning. 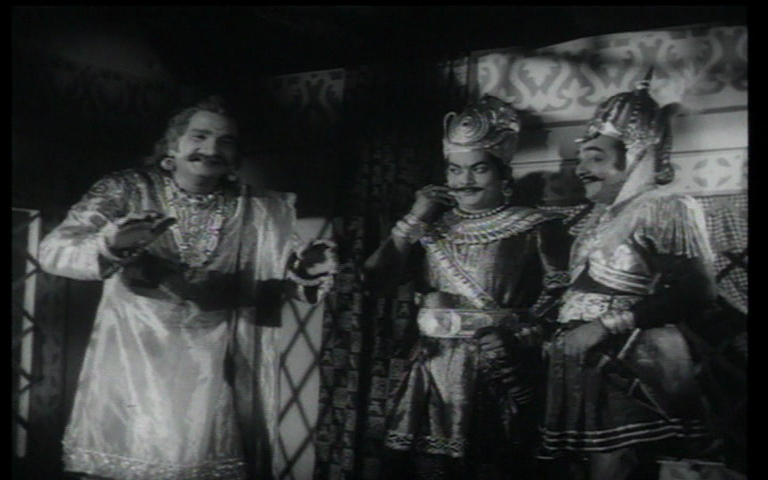 NTR makes a wonderful heroic prince and I love him in these roles, particularly with such excellent co-stars. The eye related theme is fantastic and so much fun without being overdone or used too heavily as a metaphor. I thoroughly recommend watching and as an added bonus, it is available with subtitles! 5 stars. I tracked this film down after reading Minai’s excellent blog post. 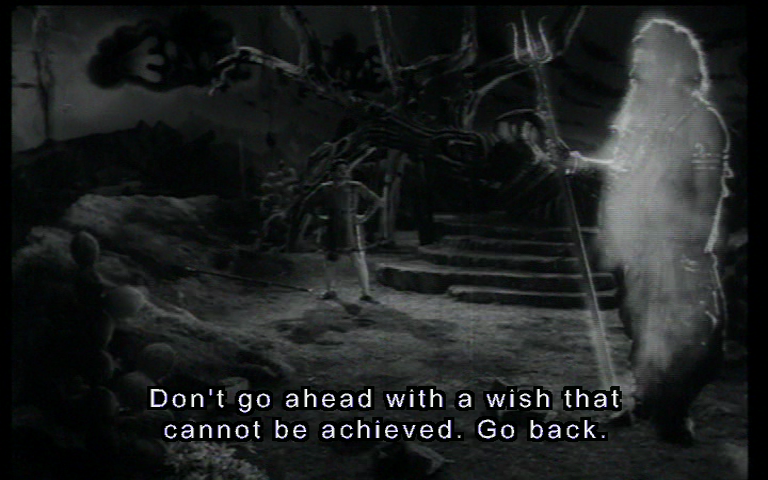 While I enjoyed it immensely, there are a couple of things that didn’t work so well and I wouldn’t put this quite at the top of my list of vintage Telugu fantasy. 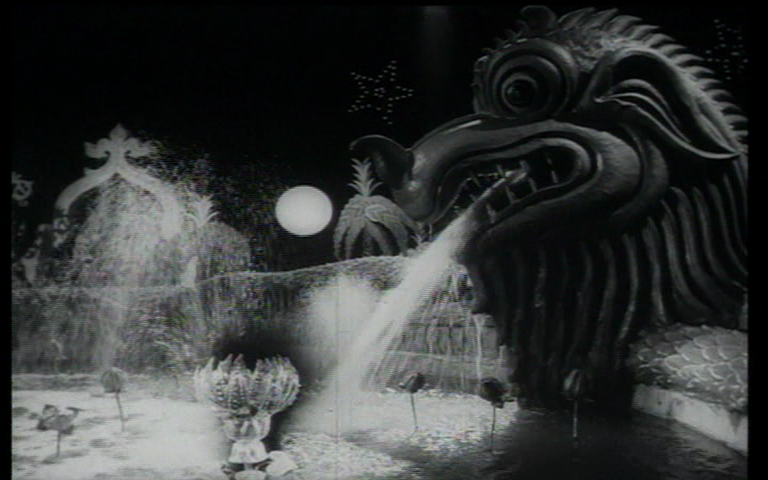 After the great start with jaunty music and skeleton, the device of a story being told within the film detracted a little from the opening sequences. There was a bit too much telling via voiceover and not enough getting on with it. I don’t particularly care for the intrusive narrator in films, unless we are talking The Princess Bride, as it can be distracting and can break the rhythm of the story. While it was intended to convey the folktale flavour, I think just showing the events happening would have been better. Heather has pretty much retold the whole plot, so I won’t go over my favourite episodes, but there are lots of obligatory folktale challenges and obstacles, all solved in a stylish and heroic manner. But while there is a lot happening, and lots of characters coming and going, this felt like it was plodding along at times where it should have had more zing. Maybe that is because there just isn’t enough dancing for my liking. 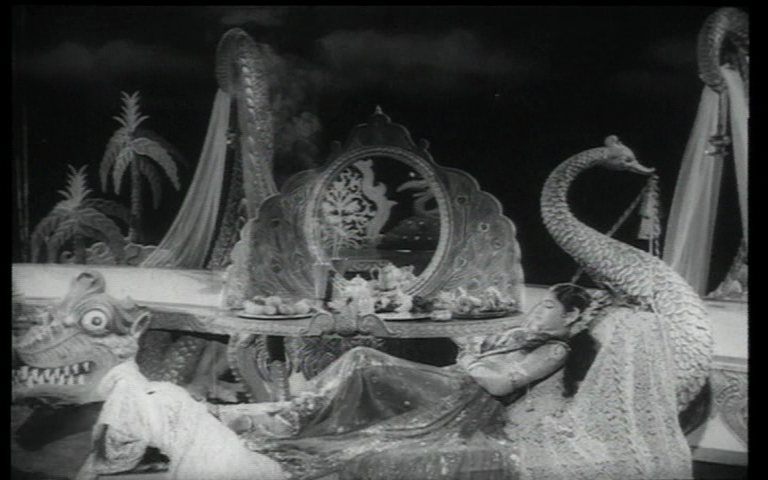 Compared to other favourites of mine like Patala Bhairavi, Bhookailas (featuring Helen!) 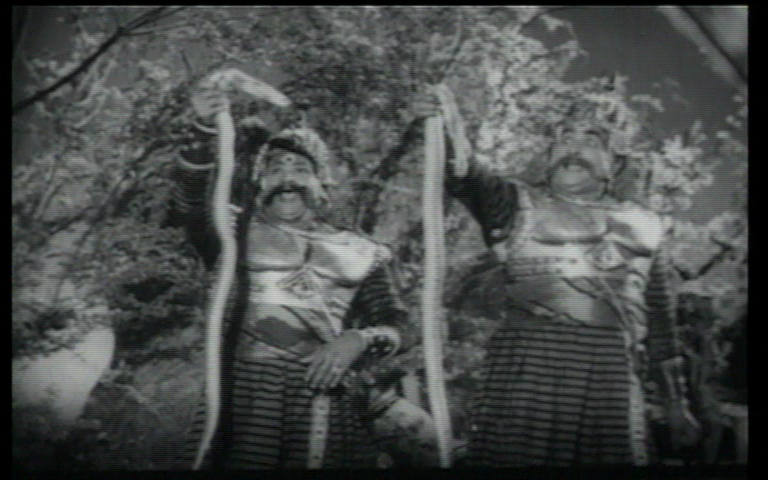 and Jagadeka Veeruni Katha (with the peppy L Vijayalakshmi as a snake goddess), this film is a bit light on for songs and dances. The music is very pleasant, and slightly eccentric at times, but I can’t recall most of the melodies now while I can immediately think of songs from the other films. Clearly I need the sparkly dance outfits and choreography to make me remember. 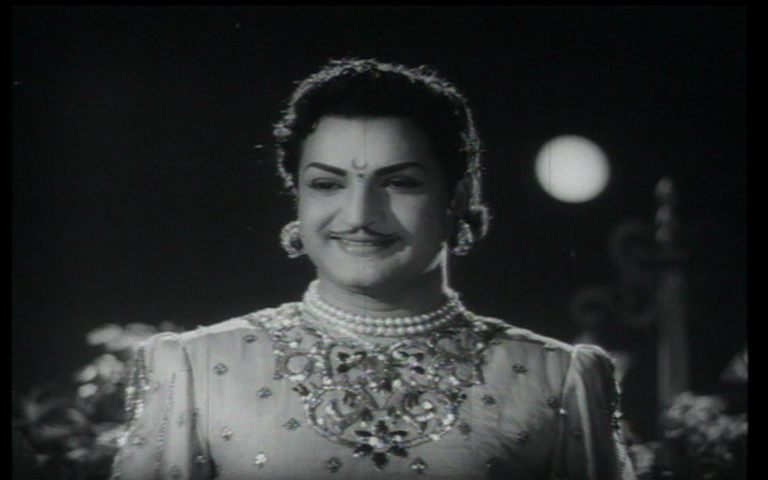 NTR has a romantic melting eyed look that suits the princely characters but is physical enough to be the heroic warrior or goatherd as the case may be. I can see why he is synonymous with this genre – it is just perfect for him. I’m quite fond of Balakrishna too so I enjoyed his contribution to the comedy and confusion. And the ladies all look stunning and suitably fairytale princess inspired, which for the most part is all they need to do. 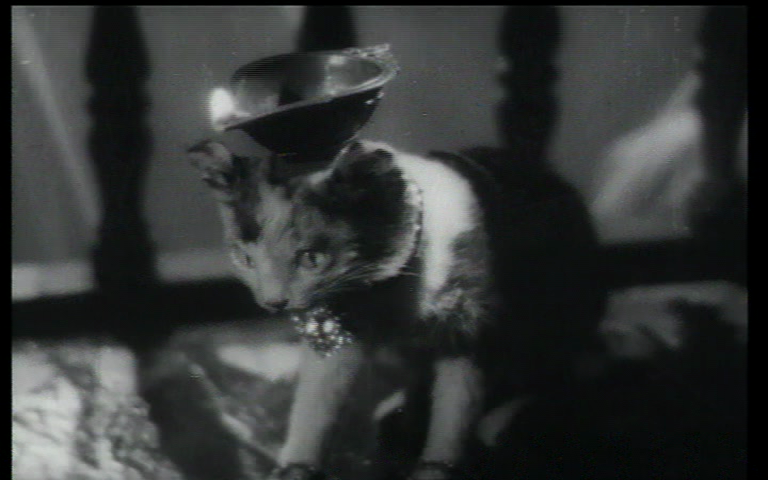 The costumes and jewellery are typically lavish and beautifully filmed. 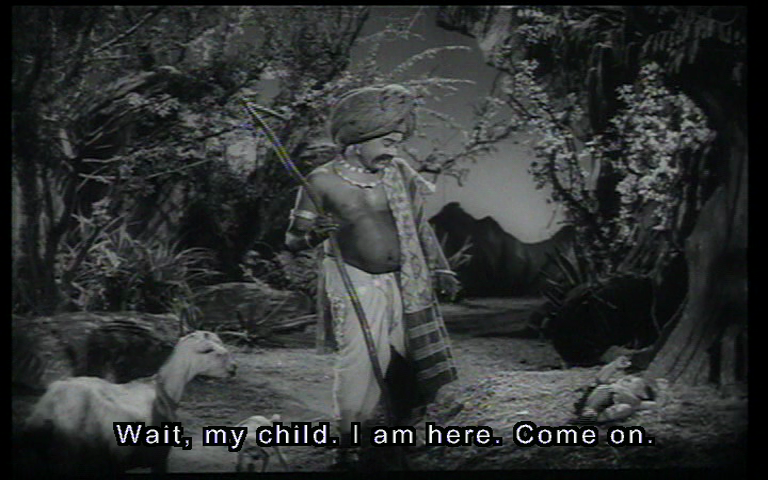 The fantasy genre is something I think Telugu film makers excelled at in the 50s and 60s. Regardless of whether the inspiration was folktale, mythology, history or religion there is an abundance of delightful films that combine beautiful visuals with a sense of wonder and whimsy. 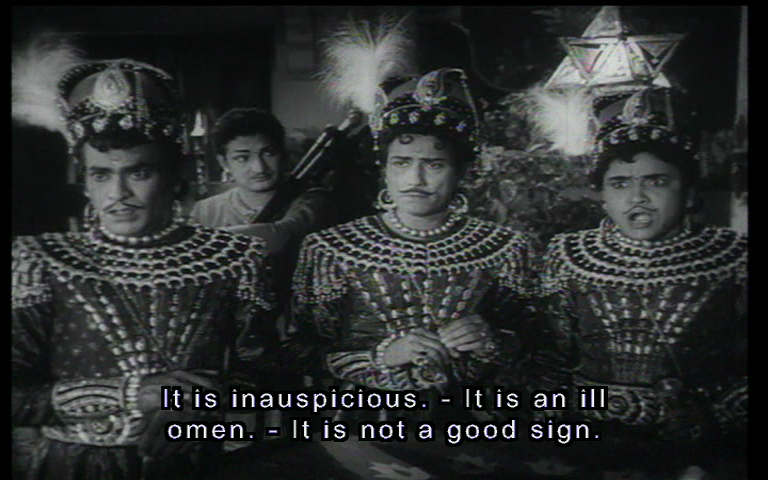 But while I like Gulebakavali Katha, I prefer the more sprightly energy and derring-do of the other films I’ve listed. (Although this film has NTR plucking his eyes out, I don’t think anything can top him cutting his own head off in Bhookailas. Terrible pun, sorry!) It is well worth a watch but there are other films in this style that appeal to me more. A small deduction for the slightly draggy start, and the missed opportunity for more dances. 4 stars. This entry was posted in Tollywood and tagged Balakrishna, Chaya Devi, Geetanjali, Gulebakavali Katha, Jamuna, Jyothy, Kamalakara Kameshwara Rao, Mukkamala Krishnamurthy, N.T. 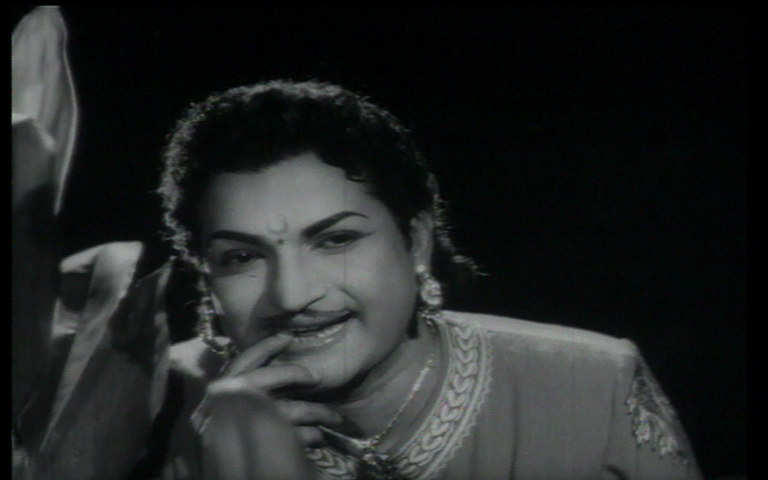 Rama Rao, Nagaratnam, NTR, Rajanala, Rajanala Kaleswara Rao, Rushyendramani. Bookmark the permalink. I haven’t watched this movie so can’t really comment on it…but just wanted to say(or rather type) that……I myself like such Indian fantasy movies more in the black-and-white format than in the colored one…a certain aura is added by lack of colour to such movies…I don’t know why I feel like this but then…to each his own….Once again, an excellent review Heather and Temple! New movies may be good…but….Old is definitely Gold! 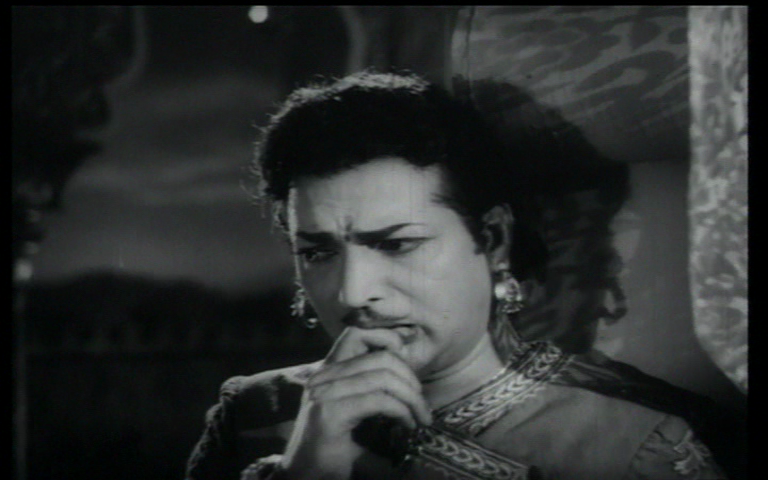 Mayabazar. One of those instances where it did actually add to the film and wasn’t overdone or garish. I’m not usually a fan but that did work well. So far I haven’t watched any of these older mythological films that I didn’t like. I just wish they would release more of them with subtitles – my constant complaint! Where’d you get a copy with subtitles? My DVD isn’t subtitled, and trying to follow the plot without subtitles gives me a headache. 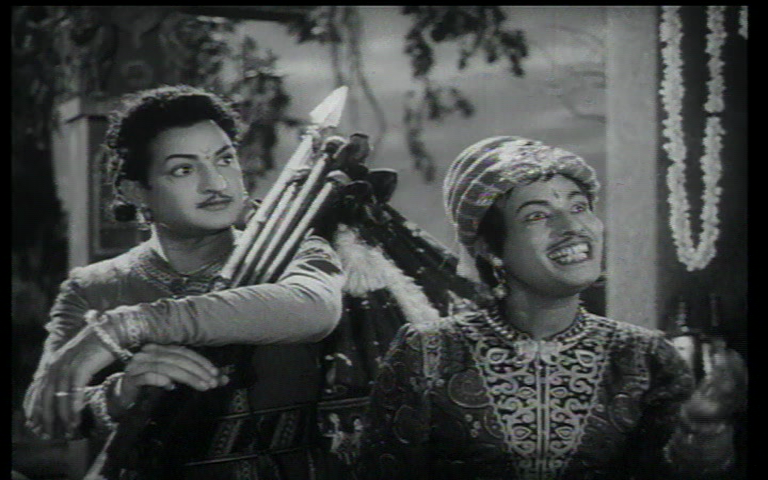 I watched ‘Jagadeka veeruni katha’ today with much of the same characters and a similar theme. Although I definitely like the songs, heroic actions and fantasy story lines in both the movies, all that polygamy grates me a tiny bit. Although, in both cases, some wives are heavenly beings and human rules may not apply. 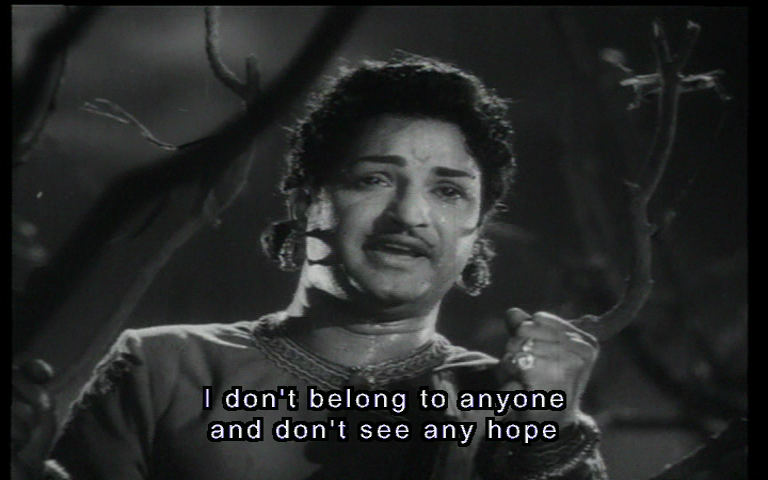 I had the exact same feeling today watching NTR unshaven after seeing his wives leave in JVK. Tarak has the exact same facial expressions and it is hard to miss the resemblance. I tend to go with the heavenly beings tag as well, although I was surprised that Yuktimati seemed to be quite happy with the arrangement! But it’s a theme that seems to occur quite frequently and in some instances I suppose is better than killing off one of the suitors. 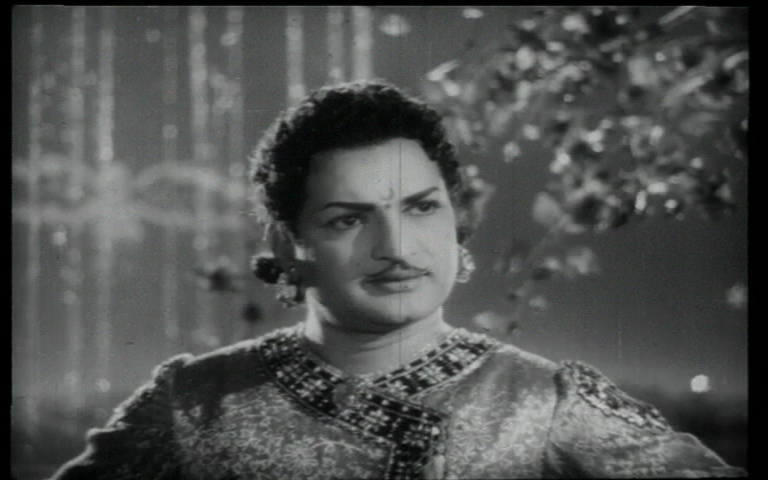 I’ve been noticing the resemblance with Tarak and his grandfather, and also with his uncle Balakrishna in a few films recently. they do seem to have the same facial expressions and do all look very much alike. What did you think of JVK? I haven’t seen it but it sounds interesting. Violet, do you know sanskrit ? How could you translate those names ? Allthough educated telugu people will understand what those names mean, some maynot even know they are essentially sanskrit words. This is mostly old (Grandhikam – Literary) Telugu and yeah, it borrows heavily from Sanskrit. I read that mostly the difference between Telugu and Sanskrit was grammar rather than vocabulary. If you are interested in ‘Padhyalu’, this is standard Telugu. But then, who cares anymore? I am ashamed of my own basic level Telugu grammar knowledge and difficulty in parsing poems.